DeVos made her comments in her keynote address Monday to the Council of Chief State School Officers (CCSSO) 2018 Legislative Conference in Washington, DC. 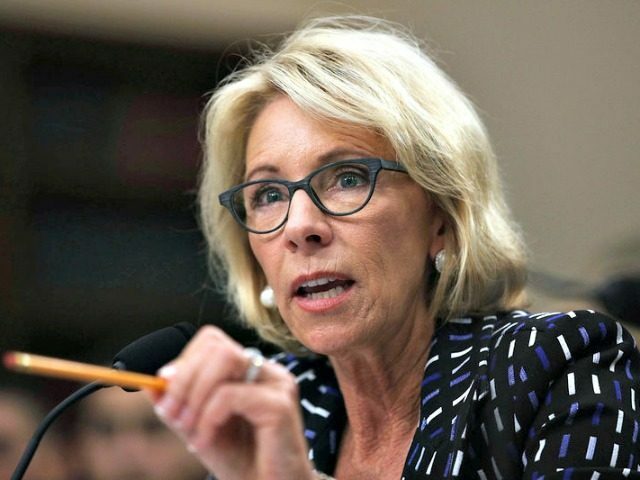 Stating her remarks amounted to “tough love,” the secretary told the chiefs she has seen little evidence of their use of the federal Every Student Succeeds Act (ESSA) to develop education plans that best meet the needs of students. The CCSSO is one of the owners – along with the National Governors Association – of the Common Core State Standards. The law is the most recent version of the Elementary and Secondary Education Act (ESEA), and one that replaced No Child Left Behind (NCLB). The ESEA was signed into law in 1965 by President Lyndon Johnson as part of his “War on Poverty” program. DeVos has been a proponent of ESSA, and said the federal law “invites a different approach” that encourages states to use “flexibility” to meet the needs of their students. While DeVos asserted ESSA offers states more freedom, the law still requires the federal education department to approve of state education plans and mandates annual testing. Many conservative education policy analysts and grassroots parents, who studied ESSA prior to its enactment, found that the federal law actually imposed the Obama-era Common Core standards on the entire country. “Now comes confirmation that the activists were dead on — and that Republican leadership, including Sen. Lamar Alexander, Rep. John Kline, and House Speaker Paul Ryan, carried out a cynical scheme to betray their constituents and give the Administration everything it wanted,” McGroarty continued, citing a Politico Pro interview with former Obama education secretary Arne Duncan. Speaking in the wake of the Florida school shooting that left 17 people dead, Tony Smith, the Illinois state schools superintendent, said the Trump administration was cutting federal funding for education, including school safety. “All of the cuts that are proposed do make it more difficult to do some of the things that people here want more of,” Smith told reporters after he and his colleagues met with DeVos. Kirsten Baesler, the North Dakota education chief, agreed. “It certainly makes our job harder to keep our students safe when our resources are being cut back or eliminated,” she said. However, Kentucky Education Commissioner Stephen Pruitt reportedly noted inconsistency in DeVos’s grading of the state education plans. He said DeVos rejected a proposal from his plan regarding school evaluation, but kept the same one in the plan from Georgia. DeVos also told state school chiefs they needed to have an “open and honest conversation about what went wrong” in Parkland, Florida where a 19-year-old young man with multiple incidents of past aggressive behavior went on a high school shooting rampage that killed 17 people. “No student, no parent, no teacher should ever have to experience what many did at Marjory Stoneman Douglas High School,” she said.